We had the annual “State of the map” OpenStreetMap conference a month ago. This was in Denver. I had a choice between this or the more sensible carbon-efficient location of Vienna for SOTM-EU a few months earlier. I decided to go to Denver. To be honest I sort of drifted into that decision in a disorganised manner, but I did have some reasons as I said at the time. The following is all the slides and a transcript of roughly what I said (or intended to say) It’s a bit of a whopper. Sorry if your RSS reader just blew a fuse. Alternatively you can watch this as a video showing slides and good quality audio, or a live action video from the front (but not so good audio). You can also see the slides on slideshare, download for OpenOffice, or powerpoint (32 MB). 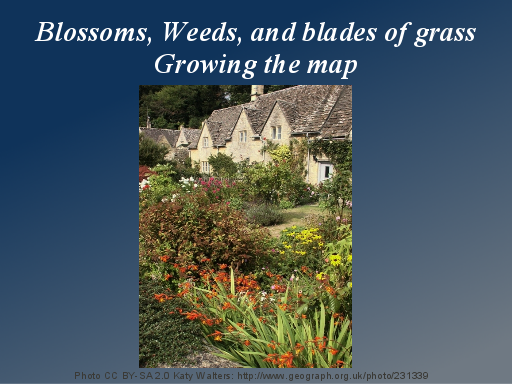 I’m Harry and I’m from England… and I thought I’d compare OpenStreetMap to an english country garden.